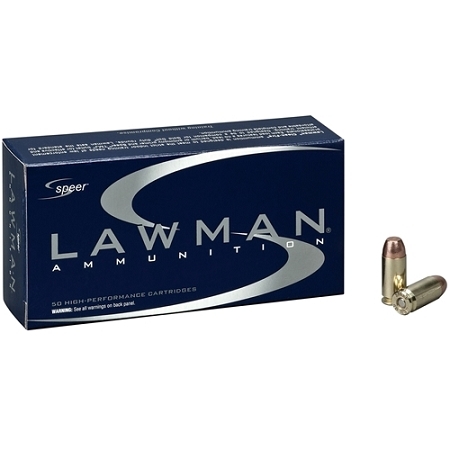 Speer Lawman 9mm ammo for sale features brass casing, non-corrosive primers and it is fully reloadable if you choose to reload your 9mm ammunition. Developed as a dual line for both law enforcement and sports shooters 35 years ago, the Lawman line has been earning its well-deserved status with its reliable, durable and superior preforming handgun ammunition. Speer Lawman completed its 9mm Luger ammunition to be Total Metal Jacket or orthodox Full Metal Jacket depending on the product. TMJ is the perfect pick for target shooting, training, or out for the day plinking away at the range. Made of a combination of clean-burning propellants, CCI primers and Speer bullets, Lawman Ammunition is a great mixture of budget and presentation. Whether new to shooting or a seasoned veteran, Speer Lawman ammunition should be your absolute first choice! 9mm Luger ammo by Speer Lawman is new production, non-corrosive, reloadable ammo, featuring brass casing and boxer primers.